The Elements of Advanced Mathematics, Fourth Edition is the latest edition of the author's bestselling series of texts. Expanding on previous editions, the new Edition continues to provide students with a better understanding of proofs, a core concept for higher level mathematics. To meet the needs of instructors, the text is aligned directly with course requirements. The author connects computationally and theoretically based mathematics, helping students develop a foundation for higher level mathematics. 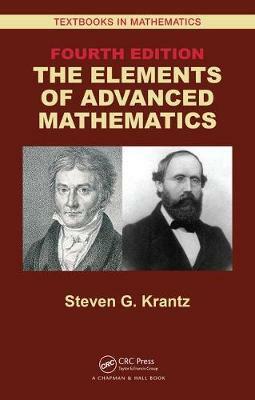 To make the book more pertinent, the author removed obscure topics and included a chapter on elementary number theory. Students gain the momentum to further explore mathematics in the real world through an introduction to cryptography. These additions, along with new exercises and proof techniques, will provide readers with a strong and relevant command of mathematics. Basic Logic. Methods of Proof. Set Theory. Chapter 4 Relations and Functions. Axioms of Set Theory, Paradoxes, and Rigor. Number Systems. More on the Real Number System. A Glimpse of Topology. Elementary Number Theory. Zero-Knowledge Proofs and Cryptography. Steven G. Krantz is a professor of mathematics at Washington University in St. Louis. He has previously taught at UCLA, Princeton University, and Pennsylvania State University. He has written more than 65 books and more than 175 scholarly papers and is the founding editor of the Journal of Geometric Analysis. An AMS Fellow, Dr. Krantz has been a recipient of the Chauvenet Prize, Beckenbach Book Award, and Kemper Prize. He received a Ph.D. from Princeton University.